German designer and aerobatic pilot Walter Extra and his company build fabulous aerobatic aircraft. 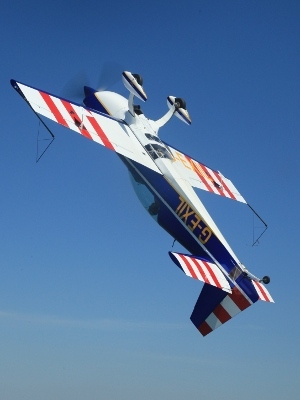 His designs have rewritten what it is possible to do in an aerobatic plane. The Extra 300S is a lighter, higher performance single seat variant of the more common two seater, the 300L. Both are extremely strong: they are certified to g-limits of +10g to -10g (10 times the force of gravity). The pioneering carbon fibre wing spar is incredibly stiff and strong, designed to an ultimate failure load of 24g – at these extraordinary stress levels the weakest point in the system is more likely to be the pilot! The single seater has a shorter wing than the ‘L, and reduced weight, yet it shares the same wing spar, hence gives even greater safety margins. The strength and stiffness make it possible to fit enormous control surfaces – the rudder is very large with a wide chord, and the ailerons are almost full span. This gives eyeball popping roll rates of around 400 degrees per second – and even faster than this in ‘snap’ or ‘flick’ rolls. Believe me, this is FAST – some machines are nudging even this figure upwards, though the limit once again becomes the pilot and his ability to stop the roll accurately! Trying to improve upon the highly successful Pitts Special biplanes of the 1970’s and early 1980’s, Walter Extra soon concluded that the future of aerobatics lay with monoplanes, both because of the intrinsically higher performance available from an aircraft that did not have to carry external struts and bracing wires, and also due to the cleanness of the profile presented to the aerobatic judges. His designs have evolved from the Extra 230 (4 cylinder engine, wooden wing), through the Extra 260 (6 cylinder engine, wooden wing), to the Extra 300 series of aircraft with their 300+hp six cylinder Lycoming engines and carbon fibre wings. The fuselage is of ‘conventional’ welded steel tube construction (good for 16g) and covered by glass fibre panels, with some fabric covering at the rear. Our own aeroplane was built in 2006 and was the last Extra 300S model produced. 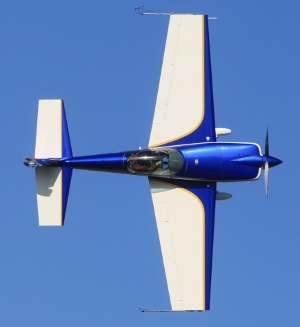 The Extra 300S has placed highly in World Aerobatic Championships, and has been flown in the Red Bull air races by pilots such as Nigel Lamb, Paul Bonhomme and Peter Besenyei. Its latest evolution, the Extra 330SC, won the World Championships in the hands of Renaud Ecalle when flown at Silverstone UK in 2009. Unlike a model aerobatic plane, thrust to weight ratios don’t quite reach the ‘magic’ 1:1 level, so indefinite ‘hovers’ are not possible – though full scale machines are getting ever closer to this. 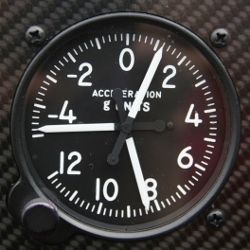 However, thrust to weight, propeller torque and gyroscopic precession are all sufficiently high that it is possible to invent a new class of aerobatic manoeuvres with these aircraft. Broadly these are the ‘tumbles’, or gyroscopic manoeuvres, and no higher level aerobatic pilot worth his salt would omit them from his display. The plane can be yawed so that it is travelling completely sideways, whilst tumbling in a tight outside loop end over end. This can be achieved whilst going vertically up, vertically down, from the top of a loop, or even straight towards the crowd! The usual reaction is ‘how did he do that? !’ (and, often, ‘ouch, that must hurt!’). I can give you a brief personal impression of what it is like to fly this machine. When the controls are kept near the centre of their travel it is an ‘easy’ (if responsive) aeroplane to fly (really!) – it is more or less viceless. Once your brain has adjusted to the pace, take-offs and landings are straightforward – more forgiving in this respect than the Pitts. Hence, operating the aeroplane ‘gently’ is entirely possible – but this of course would be a terrible waste. The Extra is such a willing performer that it begs to be pushed (and pulled) hard – and at the limits it is more than capable of inflicting pain. Despite ‘featherlight’ control forces during normal operation, in a display sequence I am sometimes having to use both hands on the stick to accurately position the controls under very high loads. In negative flicks and some tumbles it feels like your head is being ripped off your body. Yet even whilst doing so the aeroplane remains highly predictable once you have learnt its ways. Huge control authority can get you into manoeuvres quickly, but they also help to get you back out again. All types of spin can be ‘flown out’ from, with full power maintained – not the standard recovery taught to students learning to fly! It would be a privilege to demonstrate this aeroplane to you – you will be impressed. And if you ever get the chance of flying in an Extra 300 (for instance in the two seat 300L) it is likely to be an experience you will remember for a very long time – we can arrange this for you too – please get in touch!